Albert Hoyt Taylor, IRE President, 1929, was in charge of the Aircraft Radio Laboratory, and he later directed a radar development project for ships to use in order to detect enemy ships and aircraft. Albert Hoyt Taylor was born in Chicago, IL, on 1 January 1879 and graduated from Northwestern University in 1902. He undertook his first radio investigations during 1899, which led to his first published paper in 1902. He taught at the University of Wisconsin from 1903 to 1908 before going to Germany for graduate studies. He received the Ph.D. degree from the University of Göttingen in 1909 with a thesis on aluminum rectifiers. He returned to the United States and became Professor of Physics and Department Head at the University of North Dakota, where he remained until 1917. While there he built an experimental radio station which he used in pioneering studies of wave propagation and directive antennas. 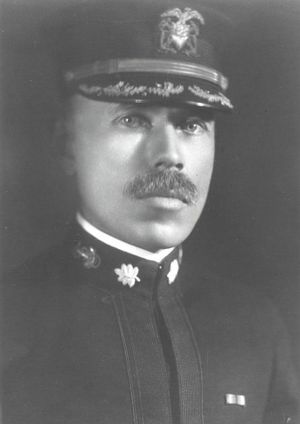 In 1917, Taylor accepted a Naval Reserve commission and was appointed District Communication Officer at the Great Lakes Naval station in Chicago. He established a laboratory and began research on the use of underground and underwater antennas for very-low-frequency radio reception. Soon afterward, he was transferred to Belmar, NJ, as transatlantic communications officer in charge of several high-power stations on the East Coast. In 1918 he was assigned to head an experimental division of the Naval Air Station at Hampton Roads, VA, where research on aircraft radio was undertaken. The following year he became head of the Aircraft Radio Laboratory at Anacostia, DC, with a staff of fifteen people. Taylor resigned from the Navy in 1922 but remained at Anacostia as a civilian employee. At Anacostia, Taylor studied the polarization of electric waves. During 1922, Taylor and Leo Young observed reflections of high-frequency radio waves from ships on the Potomac River as they passed between a transmitter and a portable receiver. In 1930, Taylor penned a report on “radio-echo signals from moving objects” which spurred the Navy’s interest in developing radio to detect enemy ships and aircraft. This led to a radar development project directed by Taylor which yielded a 200-MHz radar ready for installation on a ship by 1937. When the Naval Research Laboratory was established in 1923, Taylor became superintendent of its Radio Division, a position he held until 1945. He participated in systematic investigations of high- frequency propagation phenomena including ionospheric effects. Taylor received the Morris Liebmann Memorial Prize of the IRE in 1927 for his research on short waves. He served as President of the IRE in 1929 and was recipient of the IRE Medal of Honor in 1942 "For his contributions to radio communication as an engineer and organizer, including pioneering work in the practical application of piezoelectric control to radio transmitters, early recognition and investigation of skip distances and other high-frequency wave-propagation problems, and many years of service to the government of the United States as an engineering executive of outstanding ability in directing the Radio Division of the Naval Research Laboratory." He also served on the Communication Committee of the American Institute of Electrical Engineers from 1936 to 1942. On March 28, 1944, Secretary of State Cordell Hull presented Taylor with the Medal of Merit, one of the highest civilian decorations of the United States, for “For exceptionally meritorious conduct in the performance of outstanding services in the line of his profession as member of the staff of the Naval Research Laboratory. Undiscouraged by frequent handicaps, Dr. Taylor labored tirelessly in the course of intensive research and experimentation which eventually resulted in the discovery and development of radar. His foresight, technical skill and steadfast perseverance contributed in large measure to the timely introduction of a scientific device which has yielded the United States Navy a definite advantage over her enemies during the present war.” By the end of the war, he was popularly known as a key scientific pioneer behind the development of radar. He retired from the Naval Research Laboratory in 1948, and wrote a book about his experiences entitled: Radio Reminscences: A Half Century. Taylor died on 11 December 1961 at age 82 in Claremont, CA. James Brittain, "Albert Hoyt Taylor" ©Proceedings of the IEEE, Vol. 82. No. 6. June 1994. This page was last edited on 13 January 2016, at 17:05.